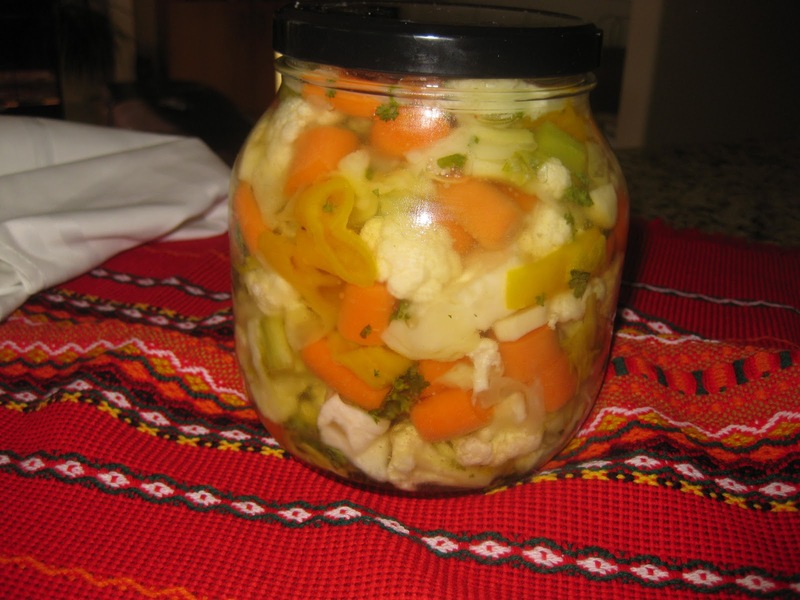 Adventures in Cookery: Pickled Vegetables - "Trushia"
Pickled vegetables, a.k.a. turshia or trushia, as it is pronounced differently in different parts of Bulgaria, is an excellent accompaniment to meat dishes. Typically it is made in the late fall with the last load of vegetables picked in the home gardens. Made in huge amount, the turshia is then stored in the darkest and coldest places of the houses to last till spring. In the older times people ate only produce in season, so the typical winter diet consisted mainly of grilled pork cutlets, and home made sausages, pork stews with potatoes, beans, pork cooked with pickled cabbage, and of course turshia. All the households in the villages had pigs and the killing and processing of the meat from the pig, usually happening around Christmas, was a pleasant occasion for family and friends gatherings and celebrations. The trushia had permanent place on the tables, used as an appetizer that people had when drinking rakia and a side dish for the meat dishes. Every family had their own recipes, or tips and tricks, and there was always a silent competition going on of who makes the most crunchy, fresh and delicious turshia. These days, when we eat fresh vegetables all year round, we don't make turshia very often. It happens once in a while, usually around Christmas, to follow the years-long tradition and satisfy the cravings we usually experience. A friend of mine DM gave me this simple recipe for a quick turshia. It gets ready in 2-3 days. There are variations of what types of vegetables you can use. In addition to my list below, you can add regular cabbage, green tomatoes, and small sweet peppers. The original recipe recommends slightly grilling the tomatoes and peppers before adding them to the mix. Boil the marinade and leave it aside. Mix all the vegetables, with the exception of garlic and parsley, in a big pot. Pour the marinade over the vegetables. Be careful not to use very hot marinade, because the vegetables will loose their crunchiness and become mushy. Cover with plastic foil or a lid and leave it for 24 hours in a cool place. On the next day, add the garlic and parsley. Pack the turshia in glass jars and store in the fridge. If you live in a cold weather you can keep it outside. Usually the turshia is ready for eating in 2-3 days. Been looking for this recipe! I remember my grandmother making this when I was a kid, and now I want to make it. Thank you for posting it!! Good dietary sources of folic acid include Brussels sprouts, broccoli, spinach and oranges. In addition, due to its importance to women of child bearing years, many common foods such as cereals and breads, are supplemented with folic acid. replika rolex klockor, som kombinerar elegant stil och spetsteknik, en rad stilar av replika rolex submariner klockor, går pekaren mellan din exklusiva smakstil.